In the past week, I’ve had a few opportunities to prepare for Christmas in terms of getting little bits and pieces for gifts for the ones I love. Money is tight, and I want to buy much more, but then I remember something far greater. In my past I have been an active member of a few church denominations, and with it still comes a deeper love for the season for the overall true message of the season. I still long for something deeper and more meaningful than simply giving presents and receiving. Something within me wants to make a difference to others and truly show how thankful I am for the life I have. I am blessed with simple things in life like a house and food in my fridge, and the love of a family – plus throw in my health. There is always something to be thankful for. This year I came across the idea of “Elf on the Shelf” and although to be honest, the Elf completely scares the bejesus out of me (I’m sure it is meant to be loving in some way, but just a bit too cheesy for me), I love the concept of doing something each day to better the lives of those you love and those around you. Truly that is something that money can’t buy and maybe some new traditions will begin as a result. This is our Family Kindness Elves tradition for this year based on a wonderful blog idea found at The Imagination Tree blog. Our Elves are simple ones purchased from Amazon for a few pounds, and I made the Daily “Challenges” from some simply present tags I had in the house. You could use any stuffed Christmas style toy perhaps for this, or just a lovely notice board dressed up with Christmas decorations placed in the family room. Total cost probably £6 to create but really the budget is exactly what you want to spend on it. You don’t need to purchase a specially designed kit for $40, as it is the concept rather than a product. Each morning, the Kindness Elves will leave a Daily Challenge note to us in the family to do something for others or each other. These challenges will be something that perhaps normal life wouldn’t normally allow us time to do, but we will make the effort for others especially. I gathered 24 ideas for each day of Advent in December from my thoughts on what we could do for others, and from sources such as The Imagination Tree blog. My hope is that each day I will share what we did that day on the blog, which will really gives us a way to record our 24 days of Kindness this year to cherish. What types of Daily Challenges will we do? 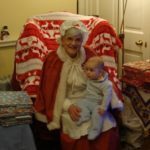 These are just a few, and all of them will appear on the Blog over December Advent in case you and your family wish to share in our Family Kindness Elves new tradition. Our little family are very small at the moment, but I hope this might be a tradition that we enjoy this year and continue in years to come. Next post #ThoughtfulThursday: A quote that speaks to my heart….